Knights Hill Publishing, 9781937396053, 298pp. A collection of novellas about women on the wrong side of the world, by turns bleak and incisively funny. LOVE IN JAPAN draws on the author's experience as an expat in Japan to paint devastating portraits of five women grappling with a foreign culture and their own desires. From a grotty hostess club to the dark side of the Japanese indie rock scene, this is the real, unsanitized Far East. Better known as a fantasy author, Felicity Savage pulls off her first literary collection with rage and brio. 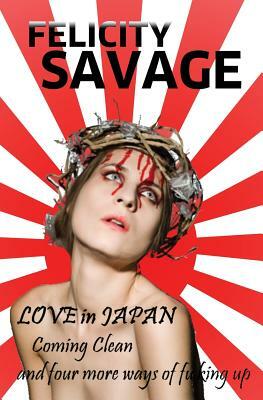 "The talented Ms. Savage has won the right to pursue her own obsessions, wherever they lead her." -- New York Times. Felicity Savage is an American author. Born in South Carolina, Savage lived until the age of two in rural France, and then in the west of Ireland. At six, she moved with her family to the island of North Uist in the Outer Hebrides, where she joined the Girl Guides and appeared in productions of Robin Hood and Peter Pan at the RAF base on Benbecula. Her first novel, Humility Garden, and its sequel Delta City were published by Penguin ROC in 1994 and 1995, while she was still at Columbia University. Her Ever trilogy was published by HarperCollins in 1995, 1996, and 1997. Savage was a finalist for the John W. Campbell Award for Best New Writer in 1995 and 1996. She currently lives in Tokyo, Japan, with her husband, daughter, and two cats (one fat and one insane). When not writing, she works as a Japanese translator, sings Gregorian chant, and moonlights as a serial houseplant killer. More information is available at http: //felicitysavage.com.